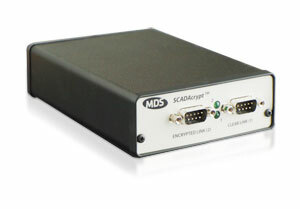 The MDS SCADAcrypt™ adds state-of-the-art encryption to your serial data radio telemetry or wireless SCADA network. It may be used for point-to-point, or point-to-multipoint links. Provides solid security to the device and/or to the host for GE MDS wireless serial systems. The MDS SCADAcrypt™ may be added to any EIA-232 interfaced radio system and installed at your own pace. When all units are installed, a single command from the master turns on the encryption system wide. The user inteface is WebServer based and password protected. Any computer with ethernet and a web browser may be used. Protect your critical system and data today, with state-of-the art AES encryption from GE MDS. 9 VDC @ 200 mA, AC adapter included.